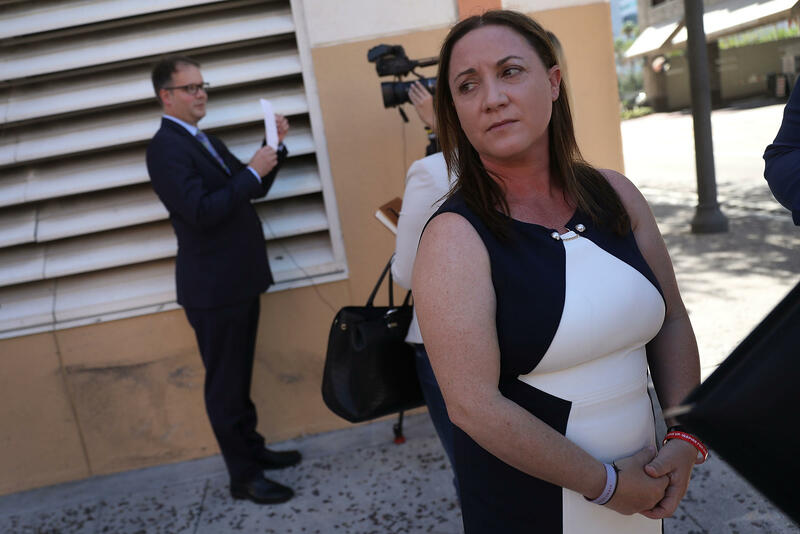 Lori Alhadeff and Ryan Petty, left, are seen in Fort Lauderdale, Fla., after turning in their paperwork to run for the Broward County School Board in May. 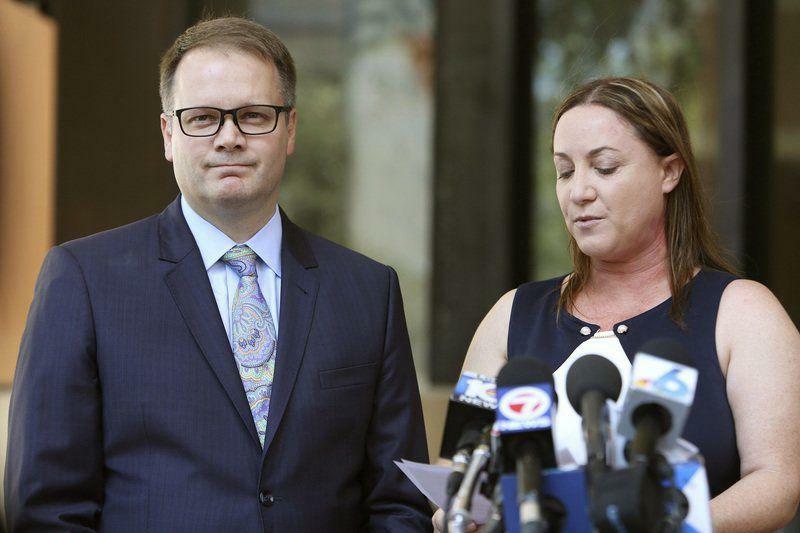 Both parents had a 14-year-old daughter who was killed in the mass shooting at Marjory Stoneman Douglas High School in February. Lori Alhadeff, right, has been elected to the Broward County School Board in Florida, after her daughter Alyssa, left, was killed in February's Parkland shooting. "When my daughter was brutally shot down with an AR-15 gun, I switched to become a Democrat," Lori Alhadeff told NPR's Melissa Block Saturday on Weekend Edition. "I feel that the Democratic Party better aligns with banning the assault weapon rifle." She says she was inspired to take political action while sitting shiva — the week-long Jewish mourning period — for Alyssa. During shiva, Alhadeff says she met a lot of community members calling for change. "Everyone was like, 'We want change, we want change,' " but at the same time, Alhadeff heard, "But I can't do it." At that point, she says, "It became very clear to me that I needed to have a seat at the table, to have a voice to have a vote. To make change happen." Another push came from Andrew Pollack, a school safety activist whose 18-year-old daughter Meadow Pollack was also killed that day, when he nominated Aldaheff on social media to run for the school board. "And I was like, 'you know what, I can do this,' " she says. Alhadeff will be sworn in this November. She's a former health education teacher, and for the past 14 years she's been a stay-at-home mom. But her lack of political experience doesn't deter her from taking on the challenge. "As a former teacher, as a former athlete, and as a mother, I knew that I could be an advocate for change and an advocate for school safety. And to be able to make change for my two boys who go to a public school, and for all of the other children — I just mentally knew that I can do it." Alhadeff handily won the vote to represent Broward County's District 4, which includes the Parkland area, home to MSDHS. When it comes to tackling the issue of school safety, Alhadeff proposes "layers and layers of protection." The first layer of protection, she says, starts at home. "Communicating with parents how they need to also be alert to their children, what's going on on their social media, looking at their phones, knowing their passwords and checking their bags." Alhadeff is following her own recommendations. She bought her two young sons, aged 11 and 13, ballistic-resistant backpacks. "I've taught them how to use that bag protect their face and their vital organs in front of their body," she says. "I've also gone through code red drills with them explaining to them to know where to go in the classroom and that if a threat comes to them that they have to fight for their life." The second line of defense is "school hardening," Alhadeff says. She wants every school to have a single-point entry. Some school safety advocates, however, don't think that implementing a single-point entry plan is a good idea when a threat requires students to evacuate quickly. Alhadeff disagrees. "The single-point entry is just getting into it one way," she says — there would be exits in different locations around the school. As for the armed teacher debate, she's firmly against arming teachers. "Our teachers are qualified to teach our students," she says. "We need to give them more paper, pens, resources for their classrooms. But absolutely we should not be giving them a gun." She thinks that responsibility lies with law enforcement, which is now mandated under Florida state law. In March, Florida Gov. Rick Scott signed The Marjory Stoneman Douglas High School Public Safety Act, designed to help prevent future school shootings. The law provides $162 million to schools to meet the requirement of stationing sworn law enforcement officers in every school in the state. Alhadeff, meanwhile, is looking beyond Broward County. "Number one, we want to make sure our schools are safe so what happens [happened] to our children never happens again," she says. She wants nationwide guidelines in place to inform schools about best safety practices. "This can come from the government and then trickle down to the states and to the state's districts," she says. "School safety is going to be different from one school to the next but we can have certain standards — just like we do for fire safety." But she's not waiting for the federal government to act. She created a nonprofit, Make Schools Safe, aimed at making every school in the U.S. safe through providing safety protocols and best practices specific to the needs of each campus. "Until we make schools safe," Alhadeff says, "I'm going to be working so hard for the next four years to work here in Broward County for the schools to make change happen — and I won't stop." NPR's Ian Stewart and Barrie Hardymon produced and edited this story for broadcast. Ordinarily, we wouldn't be bringing you news of a local school board election, but this one has special resonance. This past Tuesday, Lori Alhadeff of Parkland, Fla., was elected to the Broward County School Board. 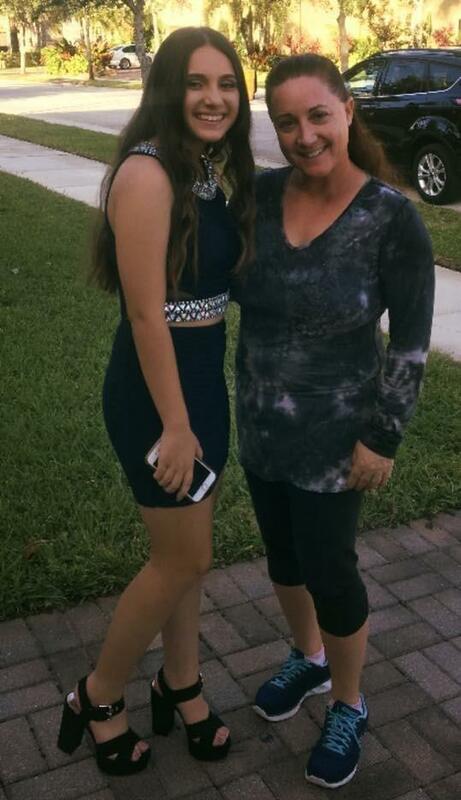 Her 14-year-old daughter, Alyssa, was one of the students shot and killed at Marjory Stoneman Douglas High School earlier this year. And that is what motivated Lori Alhadeff to run. She told me about one of her last memories of her daughter from the day before the February 14 massacre. LORI ALHADEFF: She played her last soccer game, actually, on February 13, that night. And when she got into the car, I told Alyssa - I turned to her, and I said, listen. You know, you played the best game of your life. And she was like yeah, I know, mom. BLOCK: So she could tell that that was a high point for her. ALHADEFF: Well, you know, and reflecting back on it, it was - she actually really did play the best game of her life - and being her last soccer game of her life was incredible. BLOCK: It wasn't long after Lori Alhadeff buried her daughter that she decided to run for office. ALHADEFF: It became very clear to me that I needed to have a seat at table, to have a voice, to have a vote, to make change happen. And they sort of nominated me on social media to run for school board. I was like, you know what? I can do this. And I used to be a health and physical education teacher before I was a stay-at-home mom. So I knew that I could be an advocate for change, an advocate for school safety. BLOCK: What are some of those points of school safety that you would want to change, that you will advocate for on the board? ALHADEFF: Sure. So I - when I talk about school safety, it's layers and layers of protection. So the first layer of protection is school safety starts at home and communicating to parents how they need to be alert to their children - what's going on in their social media, looking at their phones, knowing their passwords and checking their bags. And then we need school hardening. So every school needs to have a single-point entry. And we need to have an armed law enforcement or a guardian at each school. We could have a metal detector there. And if we're not going to do metal detectors, we can have metal detector wands checking kids' bags. We've had, you know, so many school shootings. And we need to start regulating and making standard school-safety guidelines. BLOCK: There's been a lot of talk about arming teachers, not just security guards. How do you feel about that? ALHADEFF: I don't think that we should arm our teachers. Our teachers are qualified to teach our students. We need to give them more paper, pens, resources for their classrooms. But absolutely, we should not be giving them a gun. BLOCK: I think a lot of people may remember really powerful footage of you very soon after the shooting in February in which you directly address President Trump with a very urgent plea. Do you feel like that was listened to? Do you feel like that has given you any response that you're satisfied with? ALHADEFF: Well, I think that the people and the public listened to me. And they agreed with me and felt my pain and agree that there needs to be change. However, President Trump - I don't think he listened to me. And I would be happy to sit down and talk to him about it. BLOCK: I gather that you used to be a Republican. Am I right about that? BLOCK: And that you switched and ran as a Democrat. Why did you switch? ALHADEFF: Sure. I switched to become a Democrat because I feel that the Democratic Party better aligns with banning the assault weapon rifle. BLOCK: Was it an easy decision for you to make? What was going through your mind when you made that switch? ALHADEFF: No, it was definitely - it was easy decision for me to make. You know, before this, I wasn't really a very political person. As far as the guns go, you know - I don't try to talk too much about because I know becomes too polarizing. We have, you know, people that go to the right, and people go to left, and they forget about making schools safe. Listen. I believe in the Second Amendment. I believe in the right for people to bear arms. But I think that we can come to common ground to make responsible laws and decisions in how we can make our society safer. BLOCK: You have two sons who are also in the Broward County School System. What have you talked about with them as they've headed back to school this year? ALHADEFF: Sure. So I've had some tough conversations with them. I bought them a ballistic-resistant backpack. ALHADEFF: And I've taught them how to use that bag to protect their face and their vital organs in front of their body. I've also gone through code red drills with them, explaining them to know where to go in the classroom and that if a threat comes to them that they have to fight for their life. BLOCK: How old are your boys? BLOCK: I wonder, Ms. Alhadeff, if there's part of you that just wants to give yourself a break. I mean, obviously, on the school board, you can be an advocate, and you can take all these issues on. I just wonder whether there's part of you that just wants to not have to do that, to not be in that position. ALHADEFF: No, I don't feel that way at all. I want to be a voice of change. And I've been fighting since February 14 to make change happen. And I won't stop. BLOCK: That's Lori Alhadeff. Her daughter, Alyssa, was one of the 17 people killed in the Parkland school shooting in February. This past week, she was elected to the Broward County School Board. Ms. Alhadeff, thanks so much for talking with us. ALHADEFF: Thank you. Transcript provided by NPR, Copyright NPR.